Any one Enzoani gown of your choice! Enzoani gown! Remember, only submissions after the final letter is released count. Guessing early does not win. 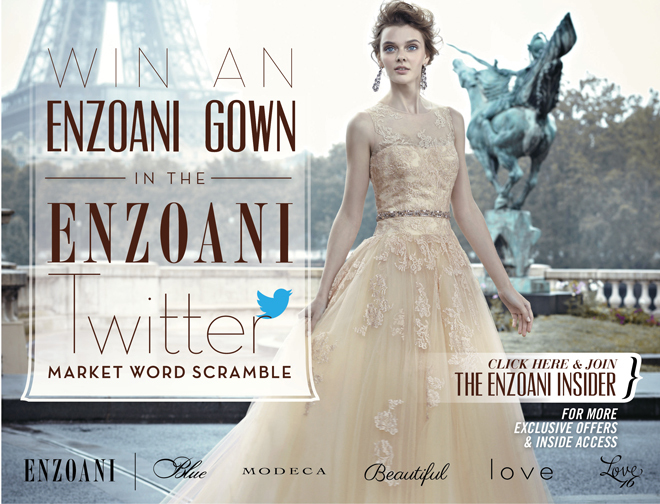 Hurry, because there is only one market left to win a bag this weekend and then your chance to be the first to gather the words and tweet it to @_Enzoani. Their last market is NY International Bridal Week – New York City on Oct. 13th-15th, 2012. This entry was posted in Fashion Designers, Womens Fashion and tagged contest, Enzoani, gown. Bookmark the permalink.